The 2018 Fleetwood Discovery LXE RV TX is Fleetwood's most luxurious Class A diesel, setting the benchmark in comfort with its list of standard upgrades. 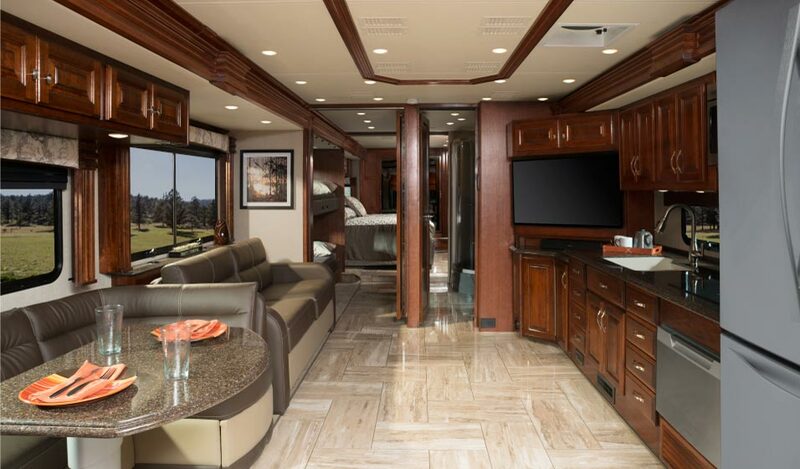 The 2018 Fleetwood Discovery LXE RV for sale in Texas is offered in seven different floor plans: 38K, 39F, 40D, 40E, 40G, 40X, and 44H. You can get the 2018 Fleetwood Discovery LXE RV for sale in is offered in four great color schemes: Champagne, Iron, Midnight, or Paradise. Visit us at your favorite Ancira RV in Boerne, TX to check out the 2018 Fleetwood Discovery LXE RV in TX. For an added touch in the 2018 Fleetwood Discovery LXE RV for sale in Texas, you'll feel right at home thanks to a 22 cu. ft. residential refrigerator, only at Ancira RV in Boerne, TX. The journey has never looked better than with a central vacuum system, Firefly Integrations control panel, and stackable washer-dryer in the bedroom. The 2018 Fleetwood Discovery LXE RV for sale near Texas offers plenty of optional features you can equip to your new RV like a front 32-inch LED TV, Sofa-L Transformer, 95-inch by 70-inch sofa, Euro Chair with footrest, U-Shaped Dinette, L-Shaped Dinette, Facing Dinette, or a Free-Standing Dinette with Credenza. 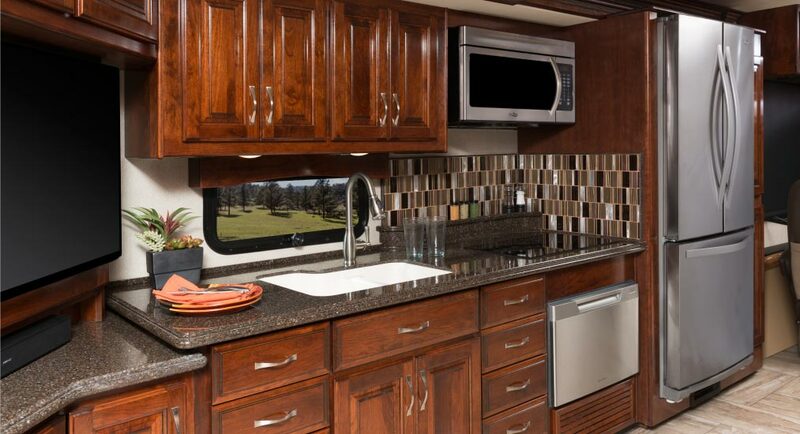 The 2018 Fleetwood Discovery LXE RV Dealer in Texas combines an 84-inch interior ceiling height with the galley's polished solid-surface countertops and hardwood cabinet doors and drawers. Other great features you will find in the 2018 Fleetwood Discovery LXE RV for sale Texas like Cruise Control, BOSE Sound bar, and LG Blu-Ray/DVD Player. The 2018 Fleetwood Discovery LXE RV for sale near me offers plenty of reliable safety features like safety glass, Daytime Running Lights, fire extinguisher, and multiple seatbelt locations, just to name a few. Find out what else the the 2018 Fleetwood Discovery LXE RV in Texas has to offer you at your trusted Ancira RV in Boerne, TX. The 2018 Fleetwood Discovery LXE RV for sale is going fast! Hurry to your favorite Ancira RV in Boerne, TX located at 30500 IH 10 West, Boerne, Texas 78006 to claim one for your very own today! You can also reach us at (830) 981-9000 for more information on the 2018 Fleetwood Discovery LXE RV for sale in Texas. Contact dealer for full details on the 2018 Fleetwood Discovery LXE RV for sale in TX, check owner's literature for full vehicle and warranty details.